Exchange Rates Some students create an entire, detailed budget and financial plan for their time abroad only to discover that exchange rates fluctuate and economies can be unstable. The value of the currency of the country of your choice against the U.S. Dollar can fluctuate significantly and can greatly affect a student's personal budget/financial plan. A solid budget/financial plan worked out months before leaving for the country of your choice just may not work at the time of departure. From the time you first created your budget/financial plan for the country of your choice, exchange rates may have changed. To avoid a problem with your budget, consider making your financial plan flexible. Include a high and low total spending amount to account for any possible fluctuations in currency value. Also, make sure to keep up to date on the financial situation of the country you will study in by constantly checking the exchange rate. Please see "Exchange Rates" in the Resources section of this handbook for links to currency converters. Lifestyle For some students, studying in the country of their choice may involve changes in lifestyle. Consider what your lifestyle at home consists of (eating out, going out, trips, shopping, etc.) and consider if you need to maintain this lifestyle abroad or what aspects you are willing to leave 'stateside.' Budgeting your money to maintain a certainly lifestyle doesn't have to be boring or difficult. You can think of easy ways to help yourself remember how much you are spending. Often, foreign currency can seem like "fake" money. It can be difficult to know how much you're spending. This is especially true if you get in the habit of using your credit card for most purchases. A helpful way to convert foreign currency into U.S. dollars is to carry a small pocket calculator with you. You could also learn a few monetary equivalents and tell yourself: "For every the currency of the country of your choice I spend, I'm really spending so many dollars." 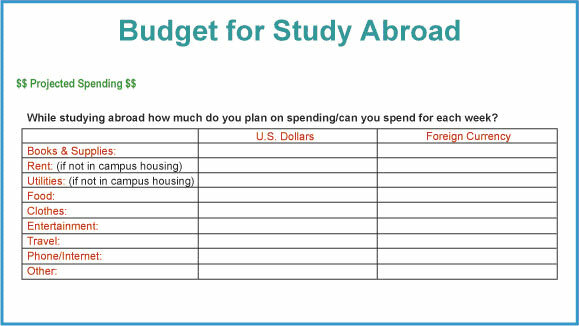 Below is a printable budget to help you start planning your study abroad finances.